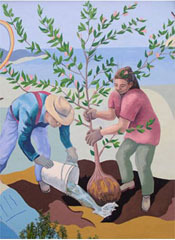 The East Gallery presents Earth Matters, an exhibition of work by the 30-plus artists who create their art at Sanchez Art Center. The word "Earth" actually holds or cradles within it the word "art." One might say that "art" is at the center of "Earth," and this small play on words highlights the deep value we find in all the arts that nourish and inspire our spirits. The exhibition also offers a chance to consider the beauty of the natural world and the fragile state of the Earth. Our planet is experiencing change. The majesty, beauty, and awe of nature are there for us to see, but so too are the impacts caused by climate change, sea level rise, pollution, and habitat and species destruction. The intention of the exhibition is not only to share with the public an insight into the artwork that is created here at Sanchez Art Center, and why art matters so very much, but also to highlight all that is astonishing about Earth and her creatures, how we have impacted her brilliance, and why protecting Earth matters for current and future generations as well as for our own souls. Two special events will be held as part of Earth Matters. 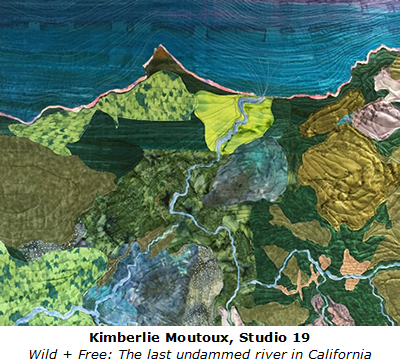 The public is invited to a Gallery Walk and Party, hosted by the Sanchez Art Center Board of Directors in honor of the studio artists, on Friday, Feb 2, 6:30–8:30 pm. Artists will talk about their work. Then on the show’s last day, Sunday, Feb 11, come tour studios and meet the artists from 1 to 3 pm. This event is followed by the 3:30 pm talk in Main Gallery by artist Sara Friedlander and curator Susan Hillhouse Leask.